Everyone knows you can't build things in America anymore. Everyone, that is, except John D. Bassett III. While one corporation after another exported their manufacturing to high-volume factories in low-wage locations overseas, Bassett's traditional wood bedroom furniture manufacturing company has not only survived, but thrived, making premium products right here in America. When everyone else was rushing for the exits, Bassett bet on the talent, dedication, and uncompromising quality of American workmanship. 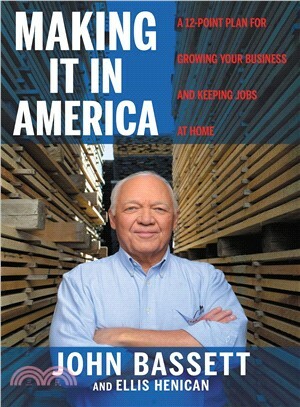 In Making It in America, Bassett tells you the secrets that have made Vaughan-Bassett Furniture so successful doing what everyone said couldn't be done. Drawing on rich life experience, including the everyday challenges running a traditional manufacturing company, Bassett constructs a 12-point plan to achieve successful leadership in any business. These steps include: Have a winning attitude, respect your employees, don't panic, reinvest constantly, and make the best of the worst. Bassett's story is about how those values underpinned his personal success and how they can revitalize America itself. In the face of feckless leadership, crumbling infrastructure, and global competition, Bassett's story is a blueprint for how America can revitalize its role as leader of the free world and how your success can be part of it. JOHN BASSETT III is a third-generation factory man who went up against the global market to save his family furniture business. He now employs hundreds of people at Vaughan-Bassett furniture. ELLIS HENICAN is a long-time New York newspaper columnist, talk radio-host, and on-air commentator at the Fox News Channel. He has written two recent New York Times bestsellers, Home Team with New Orleans Saints coach Sean Payton, and In the Blink of an Eye with NASCAR legend Michael Waltrip.